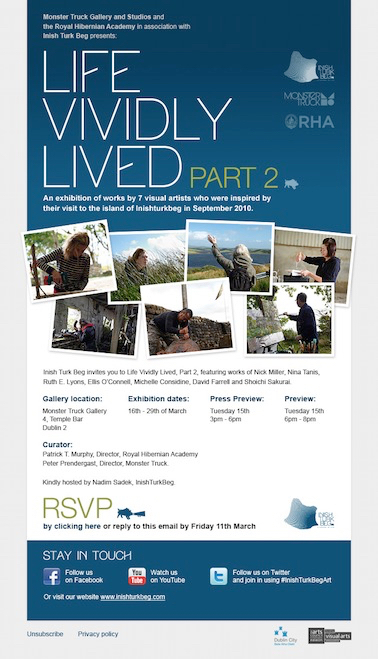 New Work including a new 360˚view of Clew Bay from the top of Inish Turk Beg. The appeal of the island and the possibility of establishing a temporary studio with a full view of Clew Bay was a temptation too hard to resist. I had in mind to attempt a 360˚sectional view of the bay from the summit of the Inish Turk Beg . As always, the reality is different: Gale winds and weather from the West meant building shelter on The Top was impossible for the first few days. The protection of a grove of the oldest trees on the island by original pier provided a site for a first work. Watching the weather charts, Island manager Johnny Delgaty and Gerry Garavan refused to be beaten as we attempted to construct various forms of shelter in high winds at the top: A garden marquee lasted 5 seconds, a square scaffold structure with tarpaulin nearly lifted us away away and finally as the weather calmed Gerry puled an old sheep trailer up the hill, and it provided a perfect open studio with the skeleton of the scaffolding functioning as a 3D viewfinder as I somehow completed eight narrow panel segments at speed over two days and finished a 360˚painted view.